We are a leading Manufacturer of crash rated cable barrier, road crash rated barrier, crash rated dual arm cable barrier and k5000 crash rated barrier from Ahmedabad, India. Designed to completely close an entrance line to a facility and bring vehicles to a rapid halt, BGI's K-series drop arm cable barriers are the barriers of choice for military, government and commercial installations around the world. BGI's K-series cable barriers are constructed to provide the highest level of protection against ramming. In the event of an attempt to break through the barrier, the cables, which are hidden in the body of the gate arms, capture the chassis of the vehicle and transfer the energy of the moving vehicle to the concrete anchors. These anchors, which can be surface mounted or below the surface, then wrap around the vehicle and bring it to a complete halt. Engineered to meet both the US DOS and UK PAS standards, the unique K-Series anti-ramming design has been proven in the field against threats including terror and theft. The K-Series barriers are installed across the world and are the de-facto standards for drop arm barrier solutions for the security services and military in a number of countries. 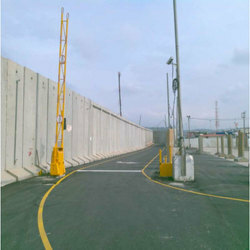 The K6000 and K5000 are also used extensively to protect commercial interests with the two-way barriers preventing threats from entering or exiting. Engineered to meet the demanding requirements of the military, the K6000 series offers maximum protection against a ramming vehicle. With configurations suitable for military or civilian installations, this barrier has been proven in the field to stop vehicles in their tracks. 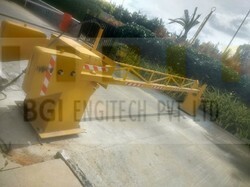 We are among the reputed firms in the industry widely appreciated for bringing forth the clients an excellent assortment of Road Crash Rated Barrier. The offered range is fabricated using genuine components, which are procured from the certified vendors of the market. Also, the range provides dual benefits of cable barriers & pneumatic operation. We employ high-end tools and sophisticated technology to fabricate the range as per the international quality norms & standards. Our range can also be availed in customized specifications, as per the client's preferences. Crash Rated Dual Arm Cable Barrier was developed by BGI Engineers to provide dual benefits of Cable Barriers & Pneumatic Operation, designed for Anti-Ramming protection of lower threats, it can operate even when there is a power failure. The K5000 Crash Rated Barrier was developed in response to a demand for a cable barrier which would close a perimeter line and provide anti-ramming protection at lower threat levels than the K6000. The single-cable design offers an elegant barrier with a low profile.